In a past interview, Carley Gracie discussed his father, Carlos Gracie, the patriarch and Grandmaster of Brazilian Jiu-jitsu and his challenge fights that many define as ‘The Gracie challenge’. In this day, many people define challenge matches from watching the UFC, or a reference to the older days dating back to 1993 when the Ultimate Fighting Championship started. Actually it dates way before that. The great Helio Gracie, who was Carlos’ younger brother learned from him and later after Carlos retired, Helio took the mantle to accept challenge matches. What was the purpose overall? angering and developing public negativity from fighter interviews or posts that forever brand into the public eye. The most prominent fighter of modern times was the great Rickson Gracie. Master Rickson Gracie had accepted challenges and was the champion of the Gracies and of Jiu-jitsu from the 80’s through the early 2000 era up until he retired. Rickson retired undefeated, and was first known in the Gracie in Action video tapes, made by his brother Rorion Gracie. Rorion Gracie is the elder brother of the Gracies, and was a key figure in starting the Ultimate Fighting Championship. Rorion promoted MMA and the challenge match points when his younger brother Royce Gracie fought and won three UFC’s. Royce won four matches in one night in UFC 2. I remember some interesting matches he had, and fighting a great Karate champion his first fight. The commentator was erroneous when he stated that Royce’s armbar was bent and usually it has to be straightened. What he didn’t know and what most people did not know was Royce actually had a collar choke, not an armbar. Back then and even to a point today, many color commentators in MMA still misstate or didn’t understand exactly what the finish really was. First of all, MMA is not a martial art, it is a sport. Proof of this is when you have a pure striker against a pure grappler. Many fighters have a strong point in one area. There are many cross styles that fighters train in. For example, Carlson Gracie’s fighters in the 90’s did boxing and Jiu-jitsu. Nearly every fighter has been exposed to Jiu-jitsu in one way or the other. Wow. Everyone wanted to know who this Rickson guy was. Rickson had followed the champion role of Jiu-jitsu, when Grandmaster Carlos Gracie was revered as our founder, that Grandmaster role passed to his younger brother Helio. Helio is Rickson’s father. Before Rickson, Rolls Gracie was the champion of the family who mentored Rickson in his younger days. Rolls tragically died in a hang gliding accident. When that happened, Rickson took the role of the fighter of Jiu-jitsu. Rickson set an impact on his talent, ability, and his charm and personality when being interviewed. Rickson is retired now, but still in good shape. I personally don’t think he has anything to prove anymore. Neither does his brother Royce, who made a tremendous impact on many when he fought in the early UFC’s. In Jiu-jitsu, we do not have a current Grandmaster. We do not have one sole man who can claim the throne of Carlos Gracie and then Helio Gracie. The founder was Carlos Gracie. His younger brother Helio Gracie inherited the throne as he took the challenges when Carlos was retired. Grandmaster Carlos Gracie himself does not get mentioned enough in my opinion. When I wrote my book years ago called Leglocks! The great equalizer, I posted a thanks to Carlos Gracie Sr. for creating a style I would learn decades later. Carlos taught his nephews, and specifically my chief instructor Master Carlos Machado much of the philosophy, training and ideas of Jiu-jitsu. Carlos Gracie had 21 children. There is no select leader of Jiu-jitsu today. There are many different artists, and ranking artists. Carlson Gracie was the heir as he avenged Helio Gracie’s loss to his student Waldamar Santana. Carlson was a mentor and man of knowledge, yet he too passed away, as did Rolls. So who or what is the heir these days? When Rolls passed away, the leaders of Jiu-jitsu went their own separate ways. Relson Gracie was also a great fighter who moved to Hawaii and still teaches BJJ there. Rickson Gracie along with the original Gracie pack and the Machado brothers moved to California. Renzo Gracie has his own federation in New York. Rorion Gracie has his academy and his own federation in California along with his two sons, and Royce Gracie has his own federation. 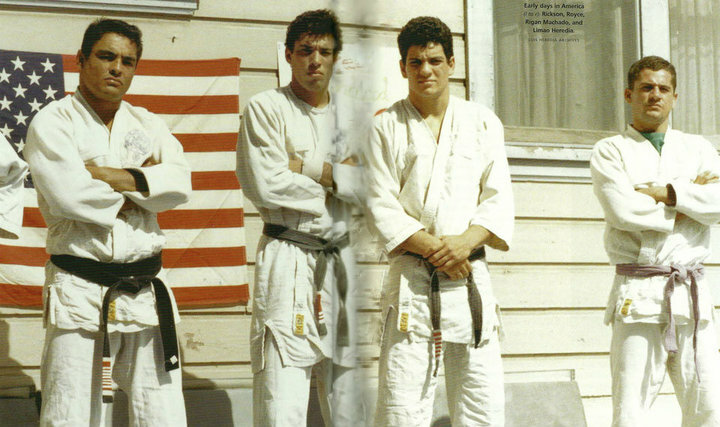 Carlos Gracie’s sons Carlos Jr. and others operate their own federation of Gracie Barra, which ironically was started in Brazil with Carlos Jr. and Master Rigan Machado. The Machado brothers, who trained under Grandmaster Carlos Gracie, Rolls, Rickson and everyone at that time developed their own legacy in BJJ. Although last name not Gracie, the Machados have stamped a large impact in the BJJ history. The Machados made a large impact in the USA and the general public in BJJ. Initially training great Martial arts legends such as Chuck Norris, Dan Inosanto and many others, the Machados also have promoted the aspect of Leave your ego at the door. My mentor Carlos Machado has become one of the pioneers in Texas, and USA. He also has spread a message of Jiu-jitsu, and namely the gentleman’s art aspect of it. I note that the Machados are also well known as the cream of the crop of knowledge and talent. Rigan Machado was revered as the best in BJJ behind Carlos, Helio, Carlson, Rickson and Rolls Gracie. Rigan was undefeated for 13 years in competition. Q: In 1988 you were running classes at the Gracie Barra Academy, can you tell me a little about that? Rigan Machado: Gracie Barra was my academy before I came to the United States. I was Carlos Gracie Jr.
they all used these new ideas to bring the jiujitsu up to a new level. It was an exiting time for me. Q: Who would you say were the biggest influences in your early years? aggressive fighters around at that time. He taught me that the more aggressive we are, the less defensive we need to be. He emphasized the attacks in jiujitsu. develop the jiujitsu game. Carlos Gracie Sr. was very influential for me. He taught me that jiujitsu is not only a sport and an art, but also a way of life. fought each other that was a good angle of understanding style from style, and the importance of Jiu-jitsu in the factor of fighting. their style, not bully people or to arrogantly show their superiority. They had to prove the validity of Jiu-jitsu.